Welcome to Fender’s 2018 Parallel Universe guitars. As Fender says, “Expect the Unexpected.” The first guitar in the series we received for review is the Limited-Edition Strat-Tele which has been another one of the more polarizing guitars of the year. The day pictures started surfacing in January 2018 of this guitar, the Internet went a little crazy. Most of the Fender hybrids in the past have either been Strats with a Tele headstock or a Tele with a Strat headstock. Versions of Strat/Tele hybrids are not a new thing, but this one does have some different features than most are accustomed to seeing. In summary, this is basically a Stratocaster with a partially contoured Telecaster body. Everything about the guitar other than the body and pickguard shape is Stratocaster. So take a new American Professional Stratocaster neck and electronics, add an ash Tele body and contour it just a bit, add a nitrocellulose finish and Custom Shop ‘69 pickups, and voila! You got the new Limited-Edition Strat-Tele Hybrid. As Todd Wisenbaker says in the demo video on the Fender website, “It’s kind of wrong but it’s right.” Whatever you want to call it, it’s an interesting mashup for sure. This Fender Hybrid begins with a contoured Telecaster ash body with a nitrocellulose lacquer finish. It has a glossy, two-tone, tobacco brown, stained finish, and the single-cutaway body shows beautiful grain. The body is mostly a Telecaster in shape but has Stratocaster-like contours at the armrest and upper back of the body. The remainder of the body has a traditional Telecaster block shape. The pickguard is also a hybrid of Stratocaster and Telecaster pickguards. The neck has a Fender standard 25.5” scale length. It has a 9.5” radius fretboard but has a newer Deep C shape neck found on the current American Professional Series guitars. The Deep C thickness is 0.82’” at the first fret and 0.920” at the 12th fret, but dimensions can vary slightly. The neck heel is standard four-bolt Fender block shape. The truss rod is a bi-flex dual adjust design. This is a Fender exclusive and can correct not just concave neck bowing (a single-action truss rod does this) but also corrects for convex neck bowing. This feature is available only on certain premium Fender models. The back of the tinted maple neck has a nice matte satin, nitrocellulose lacquer finish also with a beautiful grain. The fretboard on this model is only offered in maple and has a glossy lacquer finish, also with a stellar grain to the wood. The twenty-two frets are a modern narrow-tall size. There is a bone nut and black circle position inlays on the fretboard. The headstock is a standard Stratocaster shape and size with a silver “spaghetti” Fender logo. Notably missing from the front of the headstock is the name of the guitar. The “Original Contour Body” logo often found on Stratocaster models was on the guitar we reviewed but is not in the pictures on the Fender website (presumably they photographed a preproduction model). 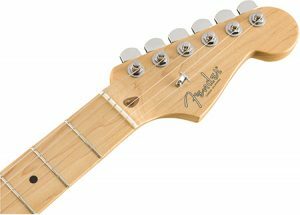 The tuners are staggered modern style found on the American Professional Series Stratocaster line with a modern style string tree. There are three Fender Custom Shop ‘69 Aged single-coil Strat pickups. They have alnico-5 magnets and all three are spec’d at 5.2-5.6 kiloohm. 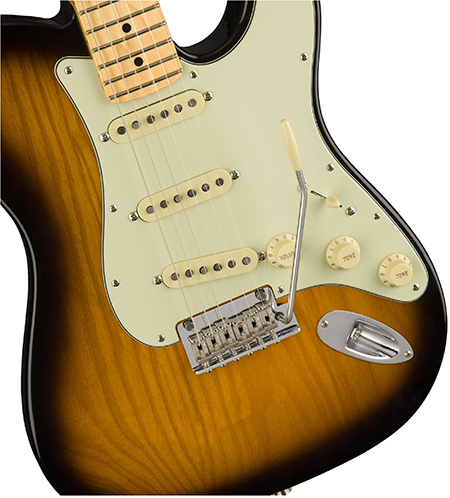 Controls include standard Stratocaster controls with a Master Volume, Tone 1 (neck), Tone 2 (bridge/middle). There is also a standard Stratocaster five-position switch with familiar wiring. The bridge is an American Professional Series two-point synchronized tremolo with bent steel saddles and upgraded pop-in tremolo arm. All hardware is in a chrome finish except for the steel saddles. The three-ply, mint green pickguard is a hybrid Strat-Tele shape. Control knobs are in an aged white plastic with gold writing. 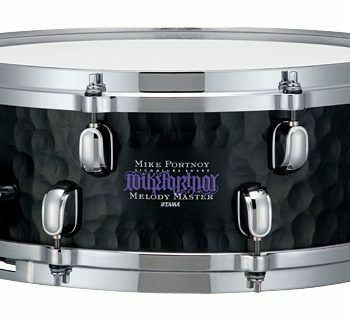 Other features to note: The four-bolt neck plate has a nicely engraved Fender logo with Limited Edition below it. 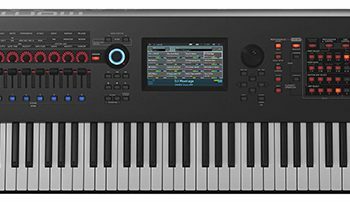 The included Fender Elite Molded Case case has upgraded latches compared to previous models (supposedly more durable for travel) and they remain TSA compliant. The guitar comes stock with Fender nickel-plated steel 0.009-0.042-gauge strings. The Strat-Tele Hybrid is a mix of modern and vintage styles and comes only in this color. Weighing in at a very comfortable seven pounds, the Strat-Tele Hybrid was perfectly set-up out of the box and well balanced once we strapped it on. The narrow-tall frets were perfectly dressed, which made large bluesy bends very comfortable. The strings were well intonated and at a very comfortably height for typical blues and rock style playing. There was no fretting-out even with large bluesy bends. The tuners were smooth in operation and the guitar stayed in tuned well once the strings were broken in. 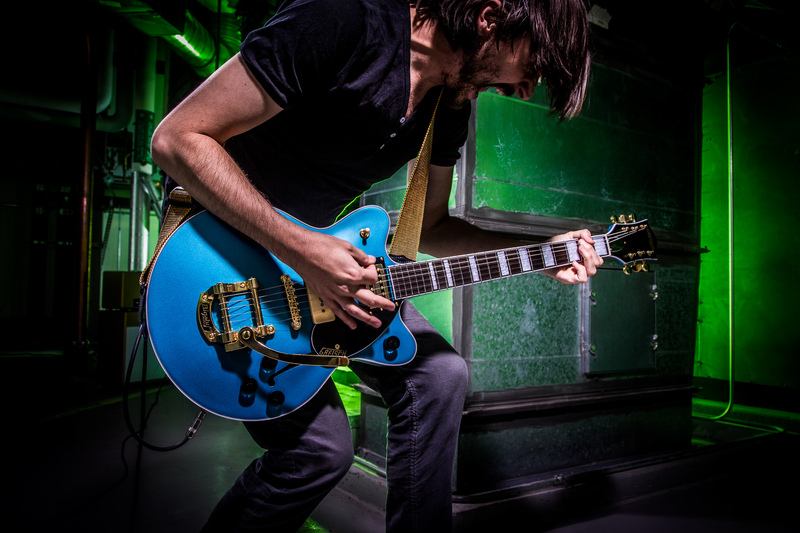 With the new pop-in, adjustable tension, whammy bar, we were able to keep it in a comfortable position and not have to fight with it being too tight or too loose. And although the guitar is not a double cutaway like a Strat, we found no significant problems reaching the upper frets thanks to the standard notch that Telecasters have for the thumb. A contoured heel would have been a nice addition to make upper frets even more easily accessible, however. The volume and tone pots had a nice resistance and feel; the five-way switch just solid enough. As noted in our review of the American Professional Series Stratocaster, this model has the new “deep C” shape neck profile, which is a nice modern refinement and happy meeting point between the Fender modern “C” and “D” shapes. The main benefit we found is that the new profile is more comfortable approaching the 12th fret and beyond. Our hands seemed to naturally hold the neck as we moved up the fretboard making bending more seamless and chords more comfortable. The back of the neck is covered in an upgraded satin, nitrocellulose, lacquer finish which should age well over many years of use. It did have a slight tackiness even after cleaning it, though. As with the American Professional Series guitars, the fretboard is once again covered in a glossy nitrocellulose finish which felt a bit thick under our fingers, particularly on the upper frets. The first thing we noticed when we unpacked the guitar and started playing was that it had a great unplugged sound and resonance. This is a well-made instrument—and it sounds like one. Regardless of the amp we played though, this guitar delivered classic Fender clean and spanky, single-coil tones. Although the year of 1969 could suggest less bright, darker tones, these pickups were similar in tone to some early ‘50s-style, single-coil pickups found in one of our other Strats. The ‘69 pickups, according to Fender, produce the full, punchy tone that defined rock in the late '60s and is especially effective with pedals. These are vintage pickups and a “1” on Fender’s 1-5 vintage-to-hot scale. Compared to the ‘54 set, these are less hot and actually have a little more treble and less bass. So, although defined as full and punchy, they are still chimey-sounding, low output, Strat pickups. We started out plugging the guitar into a five Watt, ‘50s tweed-style amp and were treated to plenty of classic Fender tone: spank, spank, spank! The pickups were really clear with just slight compression. We wouldn’t necessarily call the tone punchy, but it was classic Stratocaster tones through all positions. Country players will enjoy the tones, that although they are more Stratocaster than Telecaster, will work well with some of today’s more country-rock styles while still getting those clean, jangly sounds from the ‘50s and ‘60s. Next we plugged into our Blackstar HT-20 with Weber Bluedog speaker on the clean channel with a TS7 Tube Screamer for some pure vintage blues sounds, and the Hybrid did not disappoint. Switching on the hot button on the pedal gave us some harder rocking tones. Rolling down the treble a bit on the bridge pickup made it a more formidable option for heavier tones while taking off some of the typical harshness on bridge single-coils, but generally speaking, these pickups are not meant for metal. Switching over to a fuzz pedal and rolling down the treble some more, we strolled through songs from Hendrix to the Black Keys that sounded awesome. On to a Supro Dual Tone reissue and at lower volumes there was a great balance of clarity and jangly, early Strat sounds. Crank it to 10 and the eternal bliss of the combination of this guitar and amp gave way to punchy, thick, bluesy tones with no pedals needed. Notes remained articulate and well defined and never muddy. Rolling off the tone knob in the bridge position helped reduce some of the harshness. 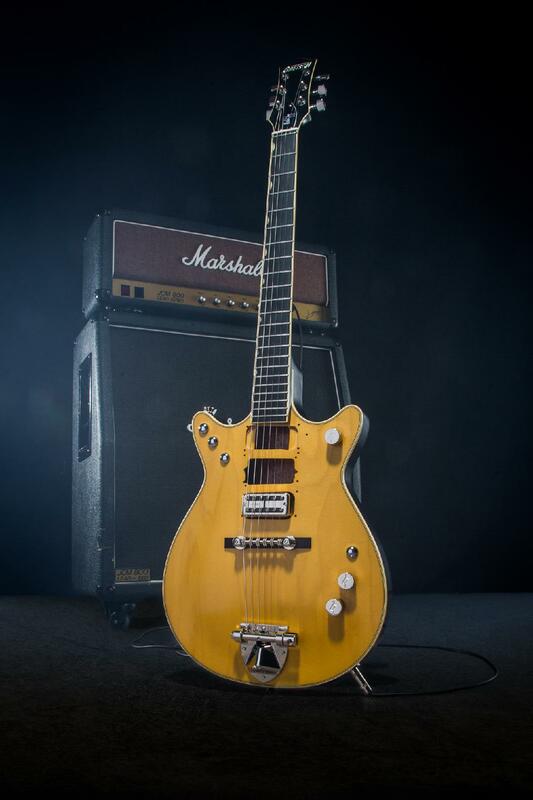 The ’69 pickups are a classic design, and as such, they have some of the equally classic hum associated with vintage single-coil pickups. The hum wasn’t excessive, though, and consistent across all five pickup positions. The Fender website is a comprehensive resource for most things that are needed including videos for set-up, intonation, truss rod adjustment, etc. There is also a very general printed manual in English and Spanish that covers warranty information. However, only the Spanish part of the manual includes any setup information. There is a very detailed description of the parts and measurements of the Strat-Tele in the service manual in the support section of the Fender website (download the PDF here). The guitar comes with a certificate of authenticity and two Allen wrenches for truss rod and bridge saddle height adjustments. The Fender Limited Edition Strat-Tele Hybrid sells for $1,999 and includes an Elite molded black case. 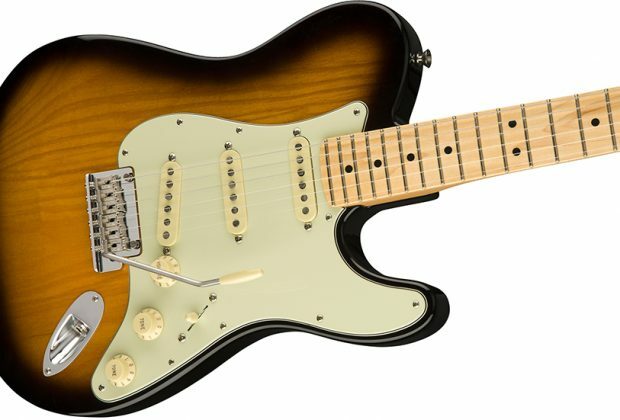 At this price point, we would have liked to have seen a contoured neck heel as found on the American Elite series and some locking tuners, but this is a limited-edition instrument and will certainly be one of the more unique guitars in your Fender stable.